Ursuline College student Theausia Holliday is using her ASCEND internship to gain experience that will help her apply for our nurse tech program later this year, and serve as a springboard for her nursing career. 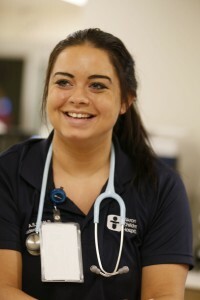 Akron Children’s is aiming to enhance nurse diversity in its workplace through the launch of a new program this summer. The program, called ASCEND (Assuring Success with a Commitment to Enhance Nurse Diversity), is a 10-week summer internship program for nursing students who are entering their senior year and are in good standing with one of the program’s partner nursing schools. 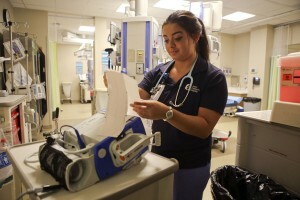 “We currently have 19 students participating in the program – 8 males, 12 first-generation college students and 3 first-generation Americans who represent Chinese, Native American, Filipino, Nepalese, Brazilian and African-American ethnicities,” said Nancy Mosca, director of nursing professional practice at Akron Children’s Hospital. The idea behind the program is to potentially hire these students into the hospital’s nurse tech program should there be a fit at the end of their internships. NICU nurse Ann Rochat is mentoring Theausia Holliday during her ASCEND internship. Ursuline College student Theausia Holliday plans to apply for the nurse tech program at the end of her internship. Students are expected to work 3, 12-hours shifts and also participate in 4-hour professional development days every week. 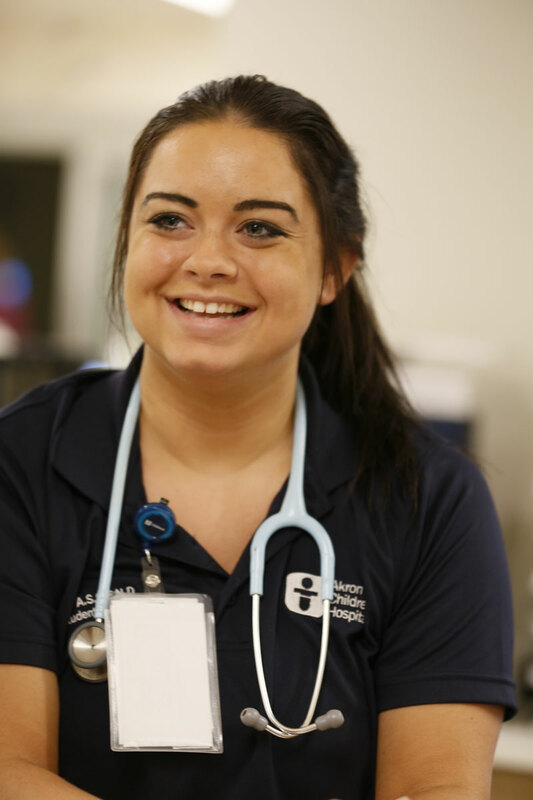 Hiram College student Dallas Cole chose to spend her entire 10-week internship in the ER. She has been paired with nurse mentor Stefanie Bodjanac. Professional enrichment experiences include hands-on nurse-related activities using case studies and simulation. Students also complete their 8-hour PEARS (Pediatric Emergency Assessment, Recognition and Stabilization) certification. Topics covered during these sessions include professionalism, priority setting, communication skills, teamwork, delegation, family-centered care, nurse sensitive indicators, cultural competence, and interview skills and resume development. According to Mosca, the interns also complete a community service project. This year’s project entails producing a public service announcement for Akron Public high school students highlighting the barriers of many inner city students to pursuing a career in nursing. “We hope to target underrepresented students and show them how to overcome those barriers,” Mosca said. Mosca gets help running the program from nursing educators Michelle Weber, Monica Andreski and Jessica Seich. Children’s currently partners with nursing schools affiliated with the University of Akron, Kent State University, Youngstown State University, Walsh University, Malone College and Hiram College. Each participant who completes the internship receives a $5,000 stipend.